The Fullerton Hotel Singapore, formerly known as Fullerton Building, was built in 1928 and once housed Singapore’s General Post Office and several government departments, playing a pivotal role in Singapore’s rich history for nearly a century. The Singapore Government announced in 1996 plans to turn the building into a hotel. 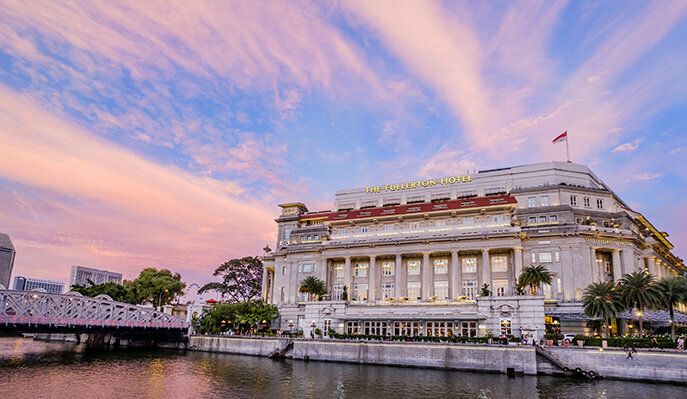 After an extensive refurbishment programme by the Sino Group, the building has been transformed into The Fullerton Hotel Singapore, an impressive 400-room heritage hotel that combines modern comfort and quiet luxury with the subtle reminders of the past. Mr Goh Chok Tong, the then-Prime Minister of Singapore, declared its opening at midnight of 1 January 2001. On 7 December 2015, it was gazetted as Singapore’s 71st National Monument by Mr Lee Hsien Loong, Prime Minister of Singapore. Made of reinforced concrete, the building possesses five frontages with a colossal two-storey Doric colonnade, creating a visually impressive façade. The façade encompasses ornate classical decorations created by Swiss sculptor Rudolf Wening and Italian sculptor Cavaliere Rudolfo Nolli, who was also responsible for the sculptural works at the former Supreme Court (present day National Gallery of Singapore) and College of Medicine Building. Designed to be multi-purpose, the building once housed the General Post Office, the Singapore Club, the Chamber of Commerce, Marine Office and other government departments. The building was completed with modern facilities, including 14 lifts and automated mail-sorting equipment for the post office. The post office occupied the basement, and the first two floors served as sorting rooms, postal halls and offices. The upper floors were reserved for the Singapore Club’s facilities, which included a vaulted coffered ceiling, reputed to be the only one of its kind in Singapore. A historic landmark which symbolises Singapore as a melting pot of different cultures, Clifford Pier was built in 1933 as the landing jetty for ships and marks the arrival point where immigrants began a new chapter of their lives. Harking back to the red oil lanterns that used to hang from the piers to alert and guide vessels to shore, Clifford Pier was affectionately referred to as Ang Teng Ma Toi (‘Red Lantern Pier’) by rickshaw pullers and the common heart-lander. 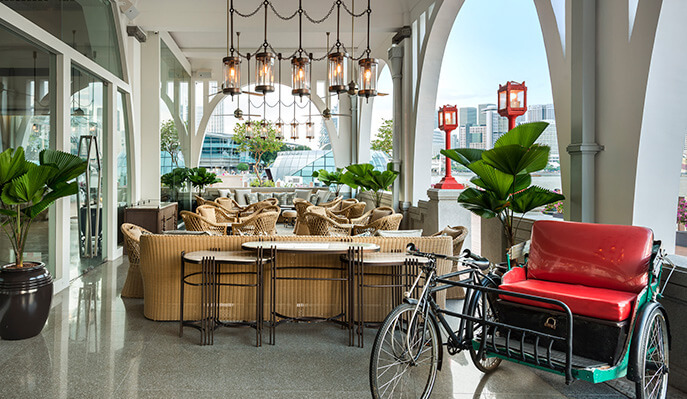 Reopened in May 2014, Clifford Pier has been revitalised as a destination restaurant of The Fullerton Bay Hotel. Acclaimed designer from Hong Kong, Andre Fu, has reconfigured this 26,000-square-foot column-free historic structure into a unique waterfront dining experience while celebrating the landmark’s history. The restaurant serves the best of Singapore’s delicacies, paying tributes to the Pier’s unique hawker culture and cultural diversity. An air of adventure and discovery surrounds the Pier which is closely representative of the Singapore story. In 2011, Clifford Pier was awarded the Urban Redevelopment Authority Architectural Heritage Awards. 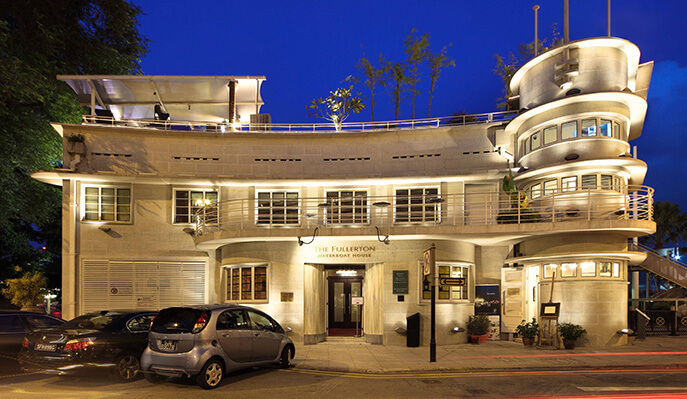 The Waterboat House is an Art Deco building designed by Swan & Maclaren and built in 1941. The three-storey building incorporates a basement which was visible from the sea. It has a prominent curved façade with a semi-circular tower-like structure facing Fullerton Road. This site also used to house the Master Attendant’s Office in the late 18th century, from which the Master Attendant supervised all water activities until the harbour moved to Keppel in 1852. Subsequently a Water Office was built here to supply fresh water to incoming ships, and was in use until 1990. On 21 March 2002, Waterboat House was gazetted for conservation. It was awarded the 2005 URA Architectural Heritage Award for the restoration works, which included recovery of the original grey Shanghai Plaster finish and addition of a new glass annex. Today, the building has evolved into a classy dining venue that offers incomparable, breathtaking views of the artful Jubilee Bridge and the iconic Esplanade Theatres. Integral to the safety of Singapore’s harbour, Customs House home to the harbour division of the Singapore Customs Police in 1969. It was here that the customs personnel kept a round-the-clock vigil from the 23-metre control tower, looking out for small boats attempting to smuggle in dutiable goods. Raids on the high seas, seizures of narcotics consignments and encounters with pirates were all part of the colourful stories that once took place on the waters by the Customs House. 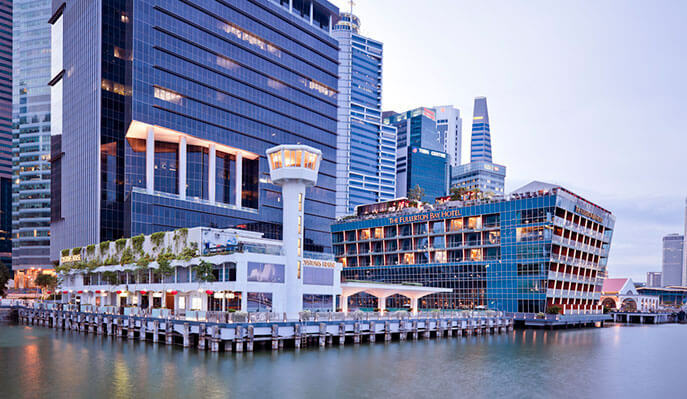 Today, the building houses an assembly of five world-class signature restaurants, each specialising in different cuisines, with panoramic views of Marina Bay and the Central Business District’s dramatic skyline. It has been lovingly restored, with its original butterfly fascia boards, beams and window panels around the watchtower kept intact. The building’s unique position flush with the seafront edge is accentuated by an infinity-edge waterscape feature designed into the heart of the site. Far East Square was opened in 1999. 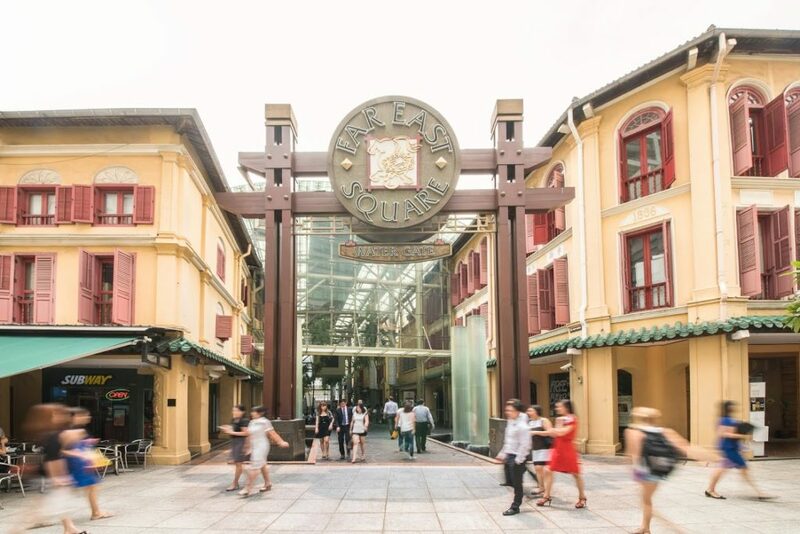 It is a heritage conservation project with a vibrant mix of restaurants, cafés, pubs, pushcarts, kiosks as well as Singapore’s oldest temple, which has been restored as the Fuk Tak Chi Museum that showcases early immigrant lives. The museum is now the entrance to AMOY, a boutique hotel that pays tribute to the lives and stories of the early Chinese immigrants.